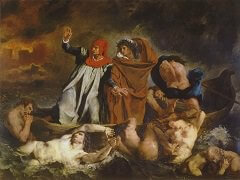 Following a visit to England in 1825, Eugene Delacroix, the leading Romantic painter in France, based this painting on the poem The Giaour (pronounced jor) written by English poet Lord Byron in 1813. The subject- passions avenged on the faraway Greek battlefield - is perfectly suited to the Romantic vision of exotic locales and unleashed emotion. 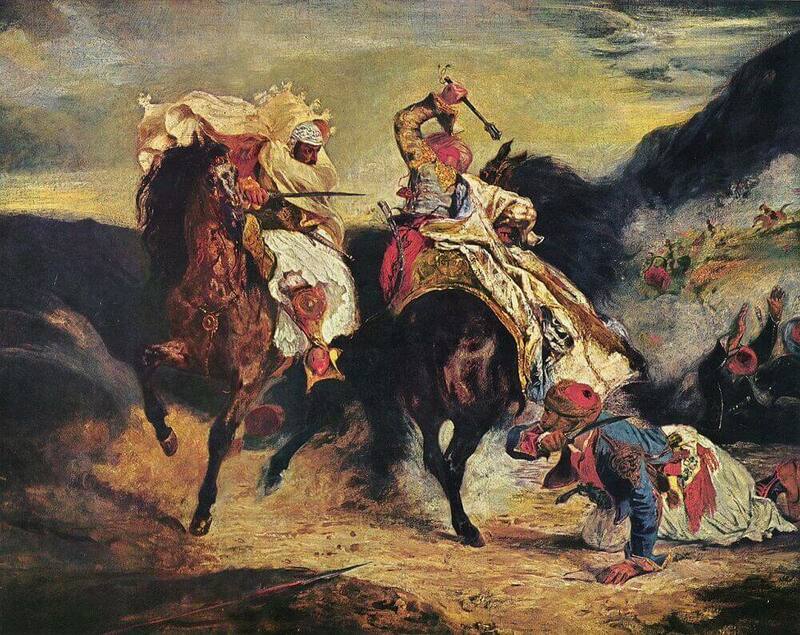 In the painting, a Venetian known as the Giaour - a Turkish term for infidel - fights the Muslim Hassan to avenge the death of his lover, who was killed by Hassan after fleeing his harem. The stark setting and aggressive movements place the focus of the painting on these two main characters. Weapons poised, the enemies face off in mirrored poses: the Giaour in swirling white with bloodshot eyes, Hassan facing his opponent with his weapon raised. The dynamic motion and emotion of the composition, which looks back to the Baroque style of Peter Paul Rubens, is further heightened by the artist's use of high-keyed colors and bold and loose brushwork. Delacroix's handling of pigments was influenced by a mid-19th-century color theory that stated that a spot of color will appear to be surrounded by a faint ring of its complement. 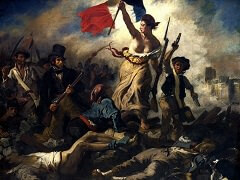 In Delacroix's painting, the adaptation of this effect is seen in the artist's use of complementary colors, rather than the addition of black pigment, to create shadows. 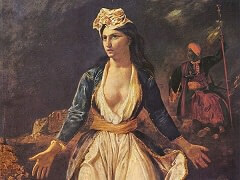 The Combat of the Giaour and Hassan was included in an exhibition at the Parisian Galerie Lebrun to benefit the Greeks and their war of liberation from the Ottoman Turks (1821-1832). 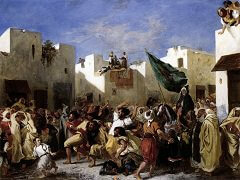 This political cause inspired numerous Romantic artists, writers, and musicians, and was the subject of one of Delacroix's best-known paintings, The Massacre at Chios. 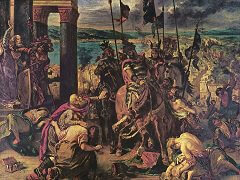 The latter painting was based on an actual incident in the Greek wars of independence, unlike the Art Institute's painting, which is derived from a work of fiction. 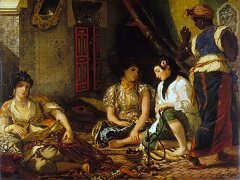 Both are examples of Orientalism in Romantic painting, in which depictions of the Middle East and North Africa emphasize the exotic appeal of the lands and their people.